I generally advise my non-vegetarian clients to eat at least 3 servings of oily fish per week. 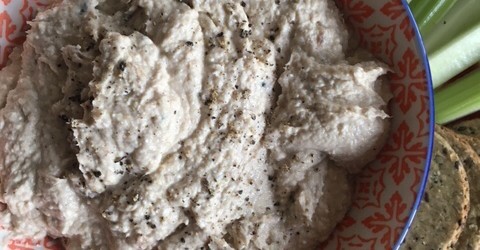 Loved by children and adults alike, this simple mackerel pate is one of my favourite ways to get a good serving of fish. You can whip it up in seconds. Oily fish like mackerel, salmon and trout are high in omega 3 fats which help to reduce inflammation; keeping our brains, heart and joints healthy. I like to use peppered smoked mackerel fillets for extra kick in this recipe. Serve with oatcakes or warmed wholemeal pitta and chopped veggies for a yummy starter, lunch or snack. If you struggle with the taste of fish start with a much higher ratio of cottage cheese to smoked mackerel. As your tastebuds adapt reduce the amount of cheese whilst increasing the fish. Place all the ingredients into a food processor and pulse for a few seconds until you reach your desired texture. Taste and add more lemon, horseradish or black pepper, if you wish. Store in an airtight container in the fridge for unto 3 days.